I am so over the moon excited to have Taylor from Food Faith Fitness here. I absolutely adore Taylor’s honesty and she is just so sweet. I am routinely blown away by her photography and even though her food looks like you’ll gain about 10 pounds from looking at it, it actually is always healthy. Bonus! 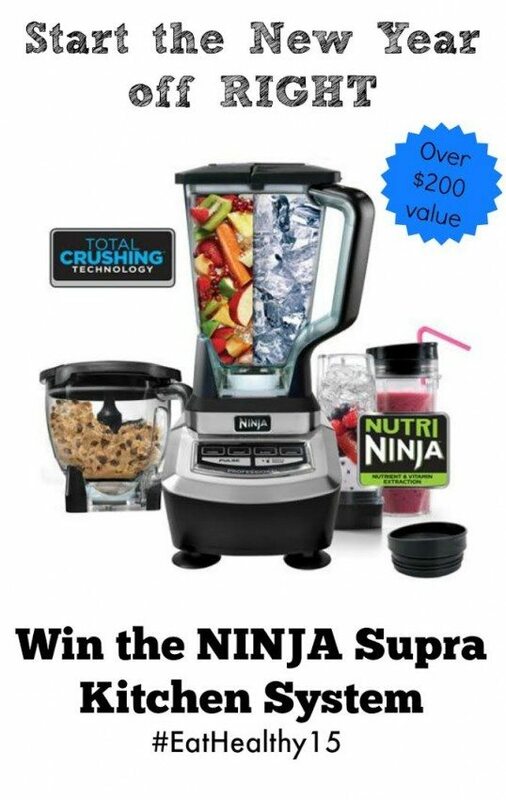 So be sure to stop by and enter to win the NINJA Supra Kitchen System that she is giving away! As well as check out Cupcakes & Kale Chips for some Healthy Desserts or Love Bakes Good Cakes for some Healthy Meal Ideas for our #EatHealthy15 Series. 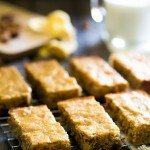 These healthy cornbread protein bars taste like the traditional bread, but with a protein boost and added pecans, apples and dates for natural sweetness! I’m Taylor and I blog over at “Food Faith Fitness!” I am SO pumped to be guest posting here at the NY Melrose Family, and sharing a super healthy AND delicious snack! But, before we dive into the recipe. I have a confession to make to ya’ll. I didn’t grow up eating cornbread. IN FACT, I only tried it for my first time 1 year ago. I grew up in Canada, and it just isn’t a “thing” up there. And now you’re judging me for saying ya’ll because people from Canada who have never eaten cornbread should not be throwing around such a word so lightly. Cut me some slack, I’m just trying to get my assimilation on. You understand. Cornbread. I tried it. I wanted to marry it. And, yes, I was honest with my hubs about the white-dress-filled thoughts that went through my brain. He loves cornbread just as much as I did, so he understood. Marriage. It’s all about communication. Although it was off the heezy, it didn’t take much to know that it wasn’t doing happy things to my waistline. I mean there are only a few ways to jam pack that much soft and fluffiness into bread. SPOILER ALERT: 10 lbs of butter and sugar. Because of my new found and TotallyAndCompletelyUndying love for this sweet, corny, baked goodness, I knew that I would want to be shoveling it into my mouth on the reg’. Which means it was going to need to get pimped out. In a healthy way. And with no Xhibit in sight. If you’re confused. Ask Google. So, because I have an obsession with protein powdering ALL THE THINGS, I turned them into protein bars. 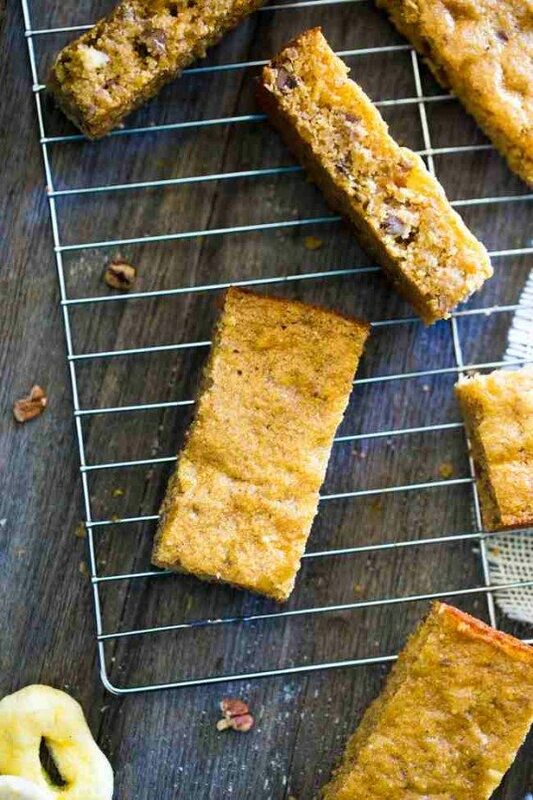 With some added texture and healthy yums in the form of dried apples, pecans and dates. I can’t lie. 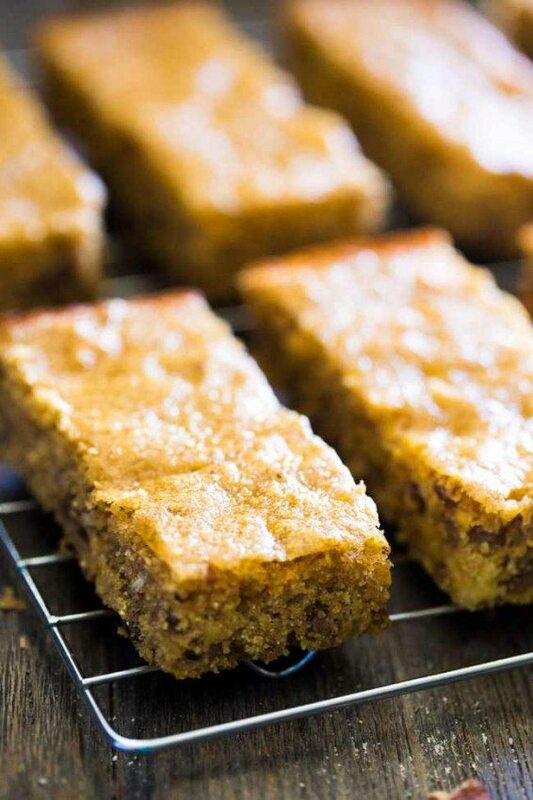 These bars took a few times to achieve that super-soft-sweet-but-not-cavity-inducing-sweet perfection that you expect from a traditional cornbread. But, you know what they say, you can’t rush perfection. I like the way their brain works. Preheat your oven to 325 degrees and generously spray an 8x8 inch baking pan with cooking spray. Place the cornmeal into a small food processor and process until it has a finer texture, and becomes less grainy. About a minute. This will help your cornbread have a nicer texture. In a large bowl, combine the ground cornmeal, cornstarch, protein powder, salt, baking soda, baking powder and cinnamon. Stir until well mixed. 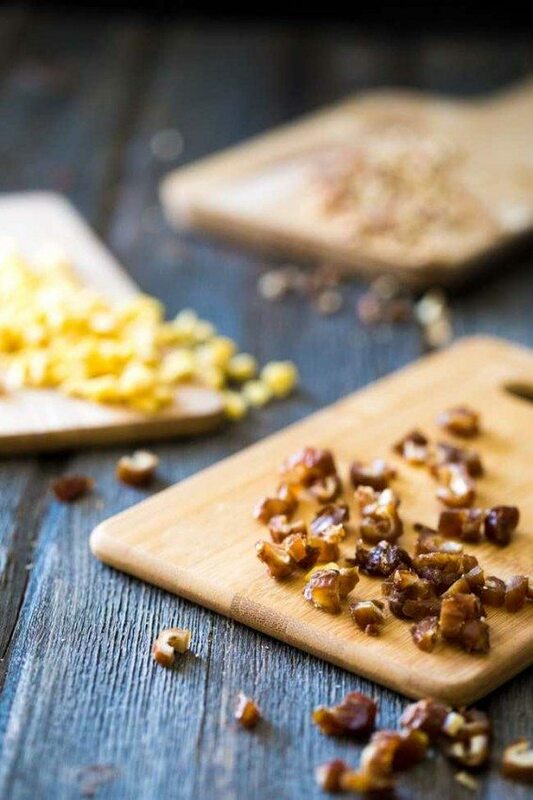 Add in the dried apples, dates and pecans and mix well. Use your spoon to break up any date that clump together. Make a well in the center of the mixture and add in the 1/4 of honey (don't melt it) and egg yolk. Lightly whisk the egg into the honey with a fork. Add in the apple sauce, Greek yogurt and apple cider vinegar and mixture the wet ingredients into the dry ingredients until well combined. Pour the batter into the prepared pan until the top looks just set, and a toothpick inserted into the center comes out clean, 20-22 minutes. 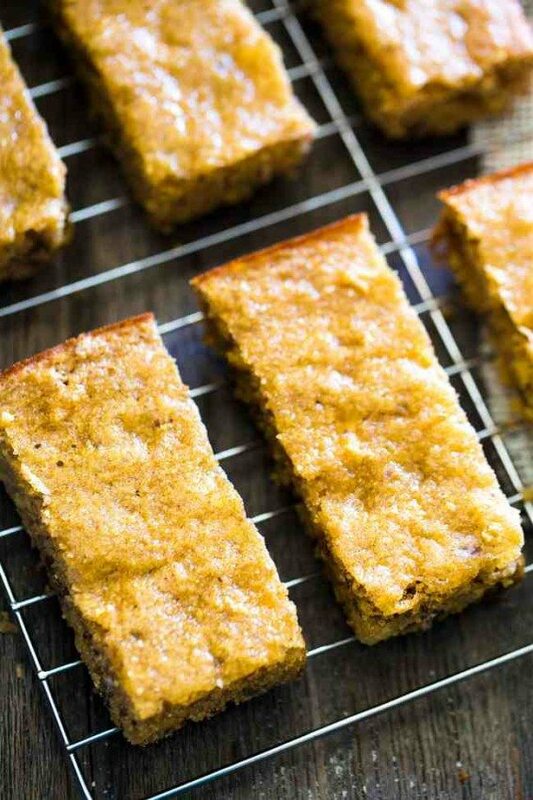 Let the bread cool and then slice into bars and DEVOUR. Bars stay fresh in an airtight container at room temperature for 2-3 days. After that, store bars in the refrigerator, but note that they will begin to become slightly dry. Taylor is the blogger, recipe developer, photographer and general mess maker behind the blog “Food Faith Fitness.” Her blog aims to show that eating healthfully does not have to break the bank or equal bland and boring! 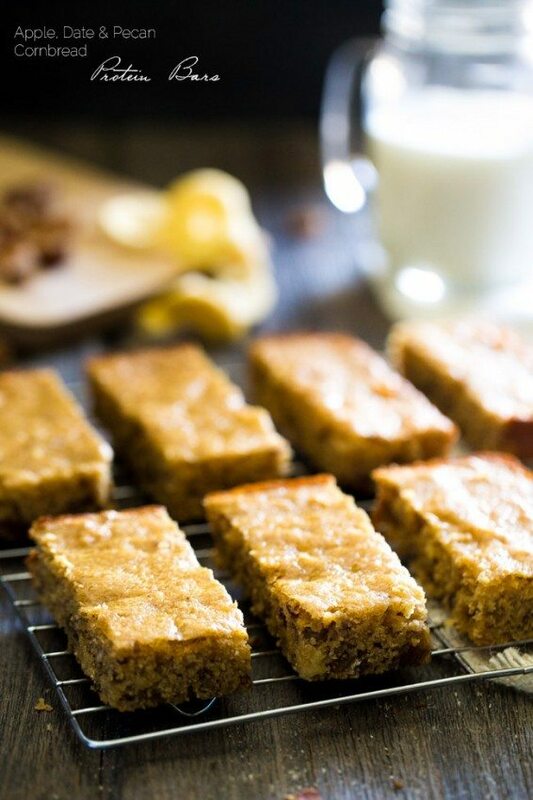 It can be easy to make and totally delicious. 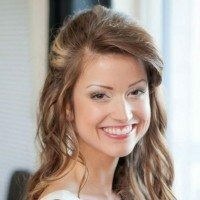 Taylor believes in living a balanced, whole life so Food Faith Fitness also focuses on fitness/nutrition tips and working on keeping Christ at the center of daily life. However, Taylor also believes that moderation is key, so sometimes it’s ok to just go and eat a cookie! When she isn’t blogging or messing up her kitchen, Taylor leads a pretty simple life. Places that you could find her include: the gym, her Bible study or just snuggling up on the couch with husband and doggy, watching The Food Network (Chopped in particular!) Taylor also has not-so-secret obsessions with all things peanut butter, cookie dough (even better if they are together!) pink and leopard print. So I’ve made these twice. Very delish. I’m wonderimg though how it can be cooked within 22mins. I’ve ended up baking mine 35 mins each time. At 22 mins center is still very jiggly. That’s baking it at 325, according to the directions. Is 325 the correct temp or perhaps a mistype? ?